Use this popular style of lettering for anything whimsical. Especially nice for teacher items. Set includes upper and lower case letters plus numbers and punctuation in 3 sizes for maximum versatility: approx. 2.5" tall, 1.5" tall, and .75" tall. Be sure to download the free sample at the bottom of this page done with the smallest size. 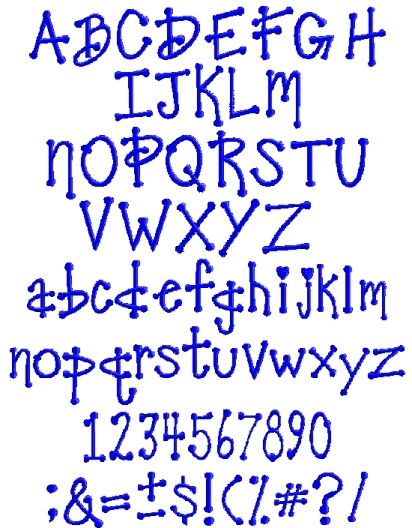 Use this alphabet as keyboard font for hassle free lettering with the Embrilliance Express! The price of this collection is only $45 for all 3 sizes.